That’s probably the best advice Schwantz ever ignored. Over his racing career, Schwantz accumulated 25 grand prix wins, a world championship and his all-out riding style made him a fan favorite the world over. Speaking to Jalopnik at the MotoGP race in Austin, Schwantz was constantly interrupted by well-wishers and selfie-seekers. Not by fans, but by competitors and team members in this weekend’s races. Surveying the motorcycle racing landscape, Schwantz, now 52, said it’s unfortunate that there aren’t any Americans following in his footsteps, or any of the other great U.S. riders that dominated the sport from the late 1970s to the early 1990s. Schwantz said it’s going to take more young American riders heading to Europe and slogging it out through the developmental ranks to lead to the next breakthrough on the international racing scene. Schwantz’s own start wasn’t easy, though he found an early supporter in legendary British racer Barry Sheene. He recalled going over to England in 1985 and getting his hands on a first-year Suzuki GSX-R that had had its transmission moved to the right side for racing at the Isle of Man TT. Schwantz is a Houston native who is recognized the world over—but not so much at home. Schwantz was a driving force behind getting the Circuit of The Americas track off the ground, but fell out with organizers. The ill-feelings have been forgiven, he said. With MotoGP bikes blaring past the paddock, I asked Schwantz whether he ever gets the itch to get back and mix it up on track with today’s generation of racers. 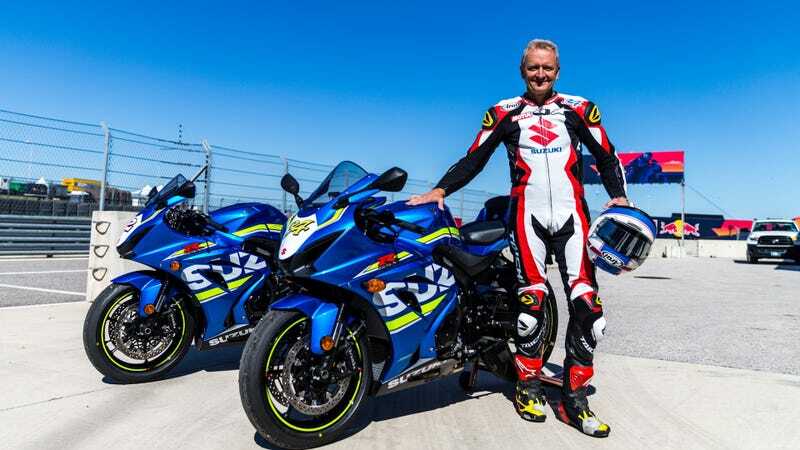 He got a wry smile on his face, and said, “No, not really.” Schwantz used to do a lot of classic bike races, but said he finds it’s no longer worth the risk. “When I raced, I used to think that I’m racing with the best guys in the world and we’re not going to take each other out,” he said. But then he got taken out by Mick Doohan and Eddie Lawson. Plus, Schwantz said, he’s used to having a target on his back when he’s on the track. “People see my name on the back and they think, I’m going to beat him and everyone will know I should have been world champion,” he said with a shake of his head. Obviously Schwantz’s mom came around to his racing career, but she wasn’t on hand for his first win at the Japanese Grand Prix in 1988. We can only hope that other moms will be as understanding when their kids disobey them to pursue racing glory.